The original poster for "Ashes and Diamonds" resembles a desperate message written down in blood. 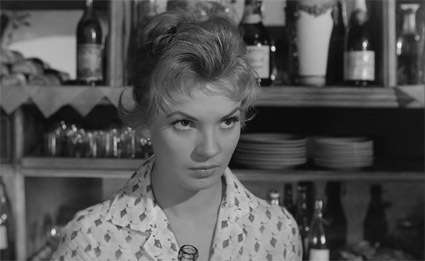 Indeed, when Andrzej Wajda's film opened in Poland in March 1958, it was greeted with a sense of urgency by the nation at large. Finally (thirteen years after WW2 ended) a movie got made that acknowledged the plight of the Home Army: the true war heroes whose vision of a free Poland didn't include a communist takeover. For more than a decade, these people have been banned from collective memory and referred to only with state-approved derision. Suddenly, a Home Army officer was the focal point of a major film. And even though he died at the end, the viewers were identifying with his lost cause rather than with the winning one. They knew the latter all too well from their everyday lives to cheer it. Based on Jerzy Andrzejewski's novel of the same name, "Ashes and Diamonds" owes its existence to the post-1956 political thaw that transformed Polish culture into some semblance of normalcy after the period of Stalinist terror and censorship. 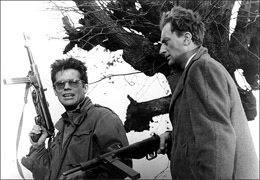 The film tells the story of a Home Army officer Maciek Chełmicki (Zbigniew Cybulski) and the order he gets to assassinate a local communist bigwig, Szczuka (Wacław Zastrzeżyński). It's the first day of peace and Maciek begins to doubt - is further bloodshed really necessary...? The film is time-specific both in historical and dramatic sense: we are as aware of the passing hours as we are of the ticking clock of history. Maciek senses that further struggle is not likely to yield any results - Poland's fate as a Soviet satellite seems more or less sealed. In the course of the movie, he tries to reason with Andrzej (Adam Pawlikowski), his Home Army superior and a literal-minded man of honor to boot. But Andrzej will have none of that: orders are orders and the fight is not over until Poland is free and sovereign again. As Maciek experiences his doubts, a fancy reception is taking place in the hotel he's staying at (as does his designated victim). The party is in fact a seething cauldron of fresh political power - it's boiling, but it's also settling firmly into place. Wajda has no qualms about presenting it as a booze-fueled affair, simultaneously random and blatantly based on conformism and servitude. The power is up for grabs and no one is more power-hungry in the movie than one Drewnowski, played by the great Bogumił Kobiela as a study in sleazy opportunism (a year later, Kobiela will take this persona even further in Andrzej Munk's absurdist meditation on Poland's "Bad Luck"). It all ends in the wee hours of the morning with a funeral-like dance of shadows, all lined up to perform the national dance of polonaise, with no visible verve or enthusiasm. His orders as clear as his resolve is wavering, Maciek spends the night joking around, picking up a pretty (if sad) waitress, and trying to figure out his priorities. The space he traverses is a symbolic miniature of the post-war disarray. Soviet soldiers march down the streets, a cross hangs upside down in a bombed-out church, the night seems damp and ominous. When Maciek finally decides to carry out his orders, he shoots Szczuka, who seeks his final comfort in his own assassin's arms. As they cling to one another - a strange father-son version of Pieta, with roles reversed and context stood up on its head - a happy gush of celebratory fireworks explodes behind Maciek's back. It's a remarkable image, later lovingly pinched by Martin Scorsese for the sake of "Bringing Out the Dead", and undoubtedly inspirational for Francis Ford Coppola (firecrackers mix well with killing in "The Godfather, Part II", and Coppola did mention "Ashes and Diamonds" in his recent "Sight & Sound" Top 10 list). Not to underestimate Wajda's achievement - or Jerzy Wójcik's inventive cinematography - but what makes the film truly unforgettable is Zbigniew Cybulski's legendary turn as Maciek. Clad in a historically wrong outfit (which looked nothing like 1945 and was in fact very much 1958), forever hiding his eyes behind shades (even though most of the movie takes place at night), he was dubbed "the Polish James Dean" for a reason. He never concealed the fact that Dean influenced his contortion-filled acting style. 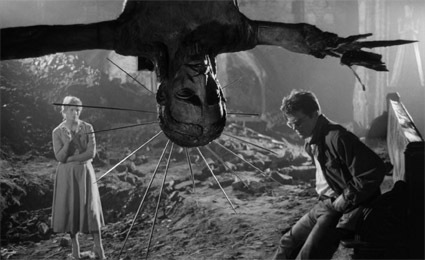 Cybulski uses his whole body to express the anguish he's in. At the same time, his face - once fully exposed in the quiet post-coital scene - reveals a delicate beauty that makes one's heart break when one realizes how much war-related pain has it been exposed to. 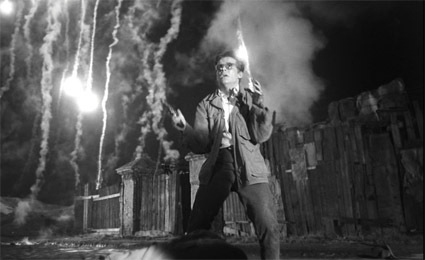 The casting of Cybulski was the single most subversive thing Wajda did in "Ashes and Diamonds", since it completely shifted the audience's sympathy towards the figure of what the authorities perceived as an ideological foe. Maciek's cause was as unacceptable for the communist party in 1958 as it was at any given moment in the history of the regime, which is the reason his character needed to die at the end. Still, by casting the communist Szczuka with a fuddy-duddy stage actor Zastrzeżyński, and pitting him against the emotional fireball of Cybulski, Wajda made sure the audience rooted for the losing side of the equation. 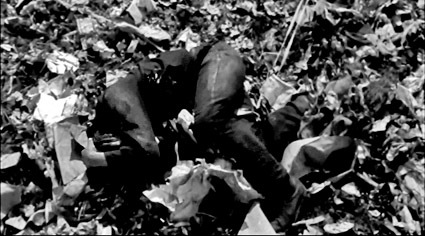 Maciek's death scene in the last shot in the film (following an altercation with the police) is a shocking literalization of one of communist catchphrases of the day - Cybulski's character truly ends up "on a rubbish heap of history", where all reactionary elements allegedly belonged. As he curls up into a fetus-like position, his hands and feet digging into the trash he's laying on, Maciek becomes pathetic - a mere piece of garbage, albeit one we learned to love and root for. It's a dehumanizing death that fails to dehumanize its victim, after all. 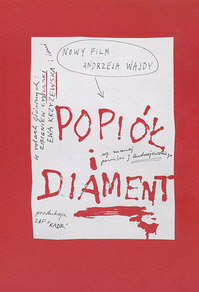 A great meditation on the nature of resistance - as well as its limits - "Ashes and Diamonds" is a string of classic scenes and moments, most of which became steady points of reference in Polish culture at large (not least for Wajda himself, who reprized one of its sequences in his stillborn "Ring with a Crowned Eagle" in 1992). Of these, perhaps the most potent one is the long take of Maciek and Andrzej's conversation at the bar with shots of pure spirit being used as candles to commemorate those who died in the war. As flame after flame crowns an array of tiny glasses, a patriotic song is sung in the background and two surviving friends think back to those who didn't make it. Just like Wajda's much later, Oscar-nominated "Katyn", the scene is in fact a secular funeral for bodies most likely never found and souls refusing to be forgotten.